Today we had a gnarly front roll through with winds gusting in the mid to upper 30s out of the SE. The dolphins were sooooo thick. We spent more time fighting fish then we did trolling. We did have a white marlin bite that didn’t come tight and lost a Sailfish, but otherwise awesome action all day! The past three days we have been super busy fishing the White Marlin Smackdown Tournament here in Cat Island. Unfortunately I have to keep it short. Short story we WON!!! 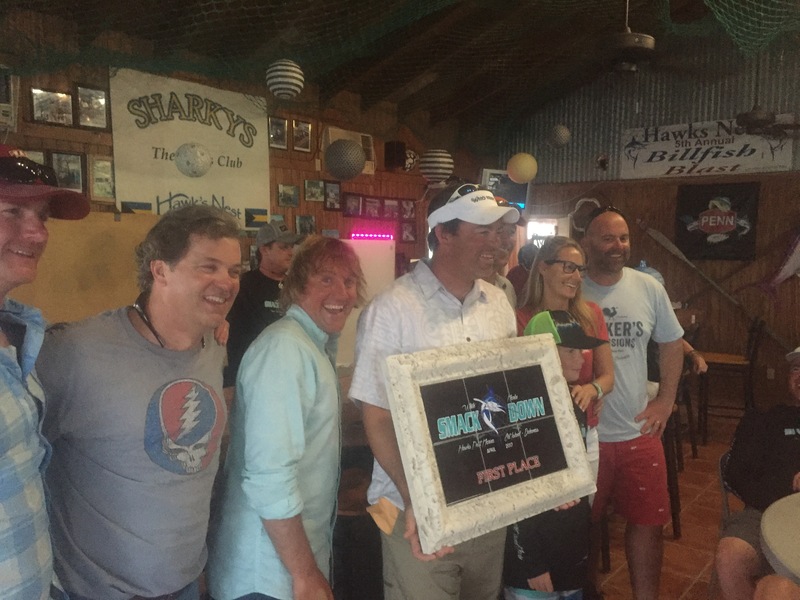 We won the overall and also largest mahi. We ended with 5 white marlin releases and 3 Sailfish releases.Stoked to have another win on Exile65. Today the winds went west and light. Beautiful weather! 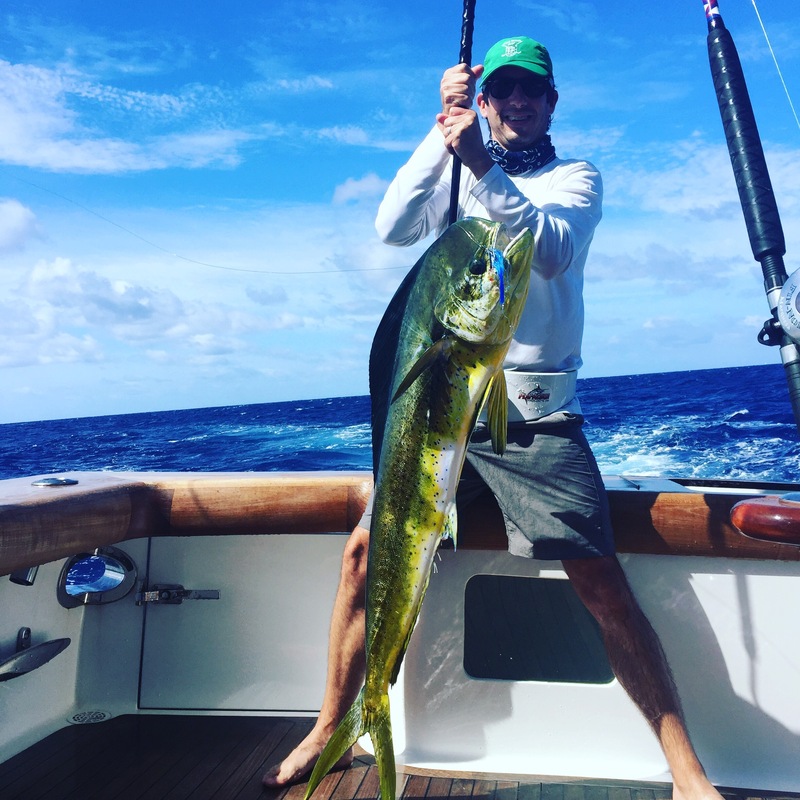 We picked at mahi all day long with our best eating a Downsea blue party hat on the left long rigger and it went 36.5 pounds to hold onto first place in the dolphin Calcutta at the moment. We released 3 Sailfish today out of 4 which has us in second place at the moment and only behind by one fish so hopefully tomorrow treats us well and our dolphin holds up and the Billfish cooperate for us? Today was Day 1 of the White Marlin Smackdown. We had winds out of the south at about 15-20 making for sloppy conditions but we knew the wind was going to go west mid day which usually shuts the bite down. The morning was crazy mahi fishing and we managed to get a white with a few mahi on to start to tournament. In the thick of the mahi we got another white which we lost. Shortly after we had a triple of sails up and lost 2 of them. Bad bad luck going on. Then we had a nice 35# yellowfin we boated with barely a tooth mark on it but enough to DQ the catch that is usually good for a Calcutta win. Overall rough day of tournament fishing but great day of fishing! We are sitting in third right now behind by 1 white marlin. The past three days we have continued to have 15-25 Easterly winds and colder temps including water temp about 2 degrees below normal for this time of year. The mahi action has been nothing short of fantastic with it being plenty easy to put a dozen gaffers in the box every day without trying too hard. We only saw one Billfish the past three days and hooked it up today, but after two jumps the whitetips anhilated the white marlin. Unreal, the whitetips have been everywhere the past few days. We have had plenty of tuna bites but no shot at getting them to the boat with the Sharks. We are prepping for the White Marlin Smackdown tomorrow then game on for the tournament Monday through Wednesday. Well today started with overcast and rainy conditions but the mahi didn’t seem to mind. 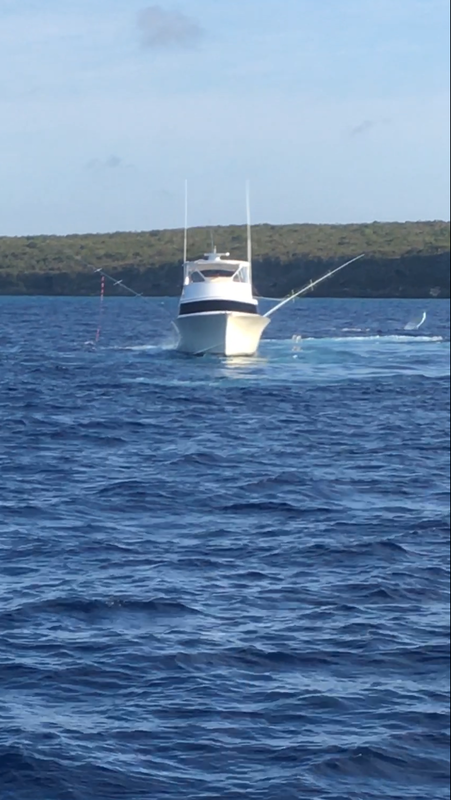 We had nonstop action on them all morning and even managed to release a white marlin on the thick of it. The whitetip sharks were out of control and chasing the mahi which made for a wild show. Pretty awesome to see the discovery channel behind your boat! Mid day the rain poured heavy but finally we got a break in the afternoon and went on the release a Sailfish and catch a few more mahi and even a blackfin tuna. Another day in paradise! Today we had the same conditions with 77.6 degree blue water and 15-25 East winds. 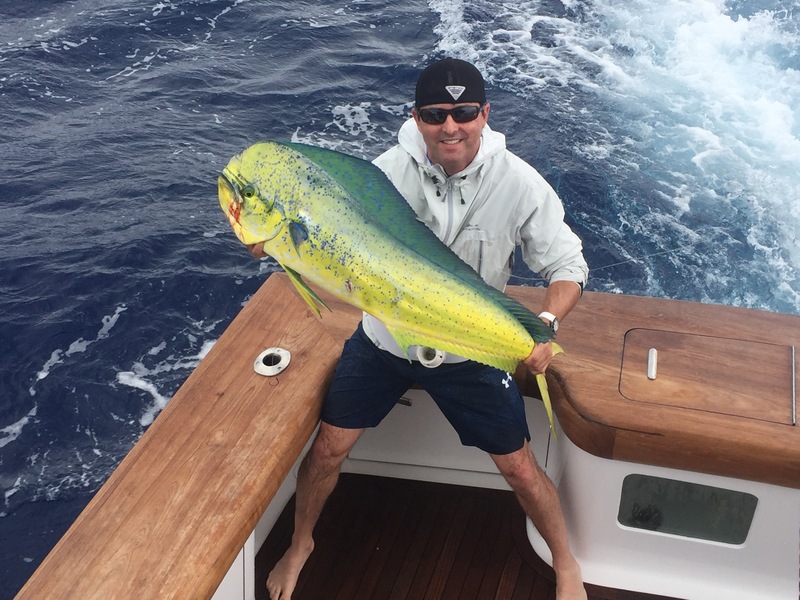 The action wasn’t rediculous on the mahi today, but we still had plenty in the box, haha. Awesome action. Mid day was slow but endnofnthe day we had an explosion on the left long and the fish took off screaming. We weren’t sure exactly what it was but once we got on top of the fish and it started moving all over we were sure it was a blue marlin. This one was very uncooperative, stayed down and swam all over. After about 45 minutes with Joe chasing it down we got an official release on it but we wanted to get a better picture of the fish so we stayed on it and a half hour later Ryan did a great job and got the leader to me so we could get the fish boatside for a quick release photo. Very fun fish that made the day. 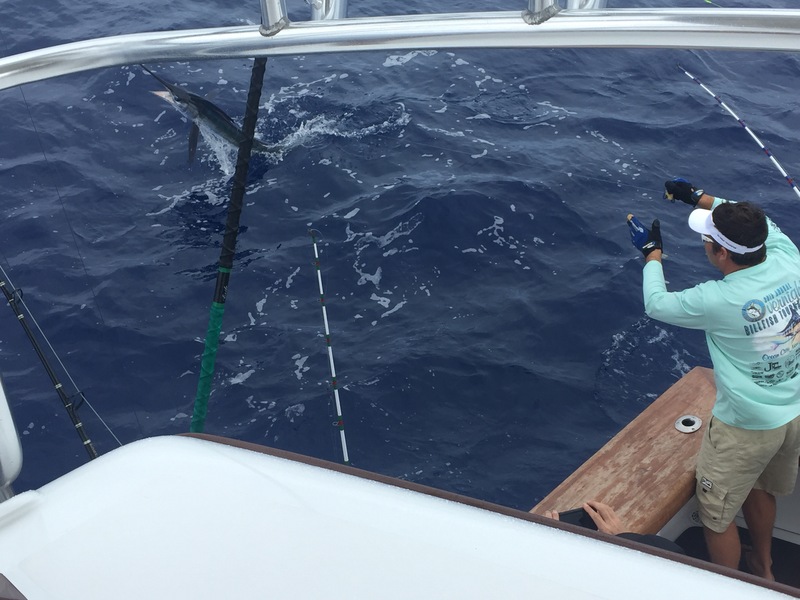 We estimated the blue marlin at 200-225 pounds. Great fish!